Add fidget spinners to the long list of toys that became crazes, right alongside yo-yos, Furbys and Silly Bandz! Even though these fun little spinners came onto the scene with a vengeance—seemingly taking over aisles at every toy store, supermarket and gas station—they’re still a beloved, welcome accessory that earns major smiles today. 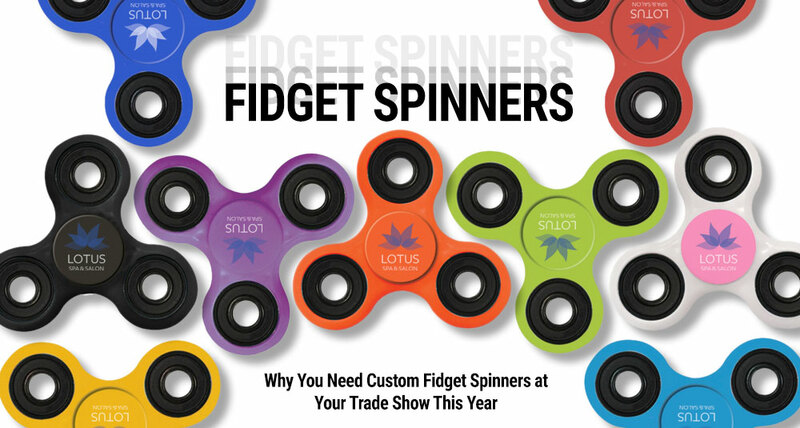 If you’re looking for a great way to get trade show attendees talking about your booth, then you can’t go wrong with promotional fidget spinners. These toys hit the mark for a wide variety of reasons, but the main one is this: they’re fun! What’s the deal with fidget spinners? New to the world of fidget spinners? Here's a quick rundown so that you know what you’re working with. Fidget spinners are small, handheld toys that feature two or three paddles attached to a central ball bearing, allowing it to spin effortlessly between your thumb and finger. It’s simple but satisfying, so much so that people use them to help calm anxious feelings and even help with symptoms of ADHD. The fidget spinner craze reached a pinnacle in 2017, when it caught on with kids and spurred trading and competitions. The beauty of the fidget spinner is that it’s fun, popular, and—because of its ability to help calm you down—useful. They’re trendy—Did we mention the word craze? Indeed, these are some of the hottest toys on the market, so you’ll have no trouble getting rid of them. Exhibitors who give away trendy promotional products tend to have more success, leading to more booth visits and leads. After all, attendees tell their friends where to find the best swag! They’re fun—Besides the fact that they’re in vogue, another main reason why marketing professionals opt for promotional fidget spinners is because they don’t take themselves too seriously. They give your brand a down-to-earth, laid-back vibe, compared with say, a promotional water bottle or umbrella. The fun feel is ideal for start-ups and disruptors with a sense of humor. They get used—Something that’s cool and fun isn’t always enough to earn points in the promo product world. If it just sits there collecting dust, it’s not doing its job, which is to remind people of your product or service. On the other hand, a custom fidget spinner will constantly be in action, offering regular reminders of your business to prospective customers. They set you apart—As you know, you’ll be surrounded by a sea of competitors and distractions at your next trade show, so it’s really important that you pick promotional giveaways that generate some buzz and get people talking about your booth. Fidget spinners have a special way of getting attendees excited, leading to more engagement. They’re affordable—When you think of affordable promotional giveaways, your mind probably automatically goes to branded pens and stickers. However, promotional fidget spinners can also be an affordable option, especially when you buy in large quantities for big shows. Pinnacle Promotions is always on hand to help you create personalized promotional products that totally suit your brand, right down to the precise coloring of your logo and the color scheme of the product you order. Branded fidget spinners are typically customized on the circular center portion, which is a great place to put your logo. Be sure to explore all of our fun promotional products so you find something that suits your vision, budget and timeline!